The tour took 10 days in August 2003. 2.8. Merida is one of the two cities in Yucatan with a convenient international airport. (The other is Cancun, but that's a tourist ghetto.) I arrived in Merida late at night, and I didn't feel like exploring the bus system so I simply walked up to the taxi booth and had them deposit me at the Nomadas Hostel for 110 pesos. 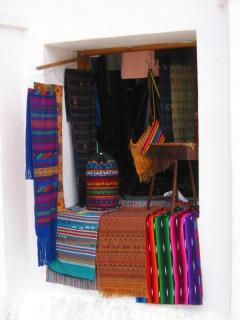 (10 pesos are about 1 Euro.) The hostel manager didn't remember my reservation but he found a bed for me anyway. It's a really noisy place, but I had earplugs. I like to begin tours like this in hostels because there are people there who can give recommendations and warnings. Sometimes there are people who go in the same direction, but not this time. 3.8. I started the day by taking the bus from the Noreste bus terminal to Mayapan, a quiet small cluster of Maya ruins an hour and a half south of Merida. The sun is really hot, and I brought sunblock and plenty of purified bottled water. (Tap water is dangerous in Mexico.) After an hour or so, I stopped a bus back to Merida, after an uncomfortably hot wait at the side of the highway. I spent the rest of the day walking around Merida. It was sunday, and they had a festival with booths and dancing around the main square at the cathedral. Downtown is a grid of streets with old low buildings, most of which need a fresh coat of paint. Streets west of the main square are generally better maintained than east. 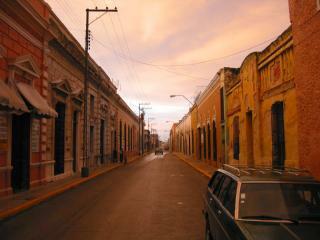 The main street is Calle 60 for a few blocks north and south of the cathedral, with many restaurants and shops. At the end of the day, after a brief thunderstorm, the whole city was soaked in the most soft yellowish pink light, just before the sun went down in a blaze of colors, like in the picture above. 4.8. The next morning I took a first-class bus to Chichen Itza. Arrive at least 45 minutes early, the ticket line can be very long and seats can run out. I had reserved a room at the Hotel Alba the day before, using a Telmex phone card. It's a nice hotel with a garden, hammocks, a restaurant, and two pools, but 3km to the Maya site is too far. I got there at noon and had a quick lunch, a chicken dish with BBQ marinade they call, inevitably, Chicken Itza. the Maya ruins at Chichen Itza are among the most impressive in Mexico. 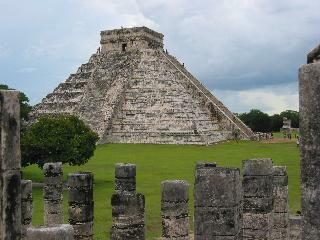 It's a huge site with many buildings, with a 44 meter tall pyramid as its centerpiece. 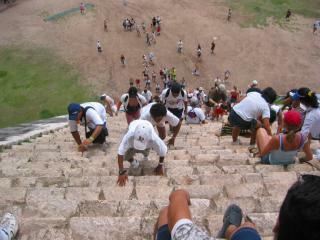 There are 92 steep steps to climb, but the reward is a great view over Chichen Itza. The picture at the top of this page shows the temple of the thousand columns, seen from the top of the pyramid. The above left picture shows the opposite view, and top right looks down the stairs of the pyramid with people climbing very carefully because it's so steep. 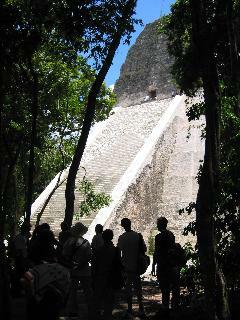 The pyramid is built on top of an older one; there is a tunnel at the northern stairway. The line was very long and very slow, but evaporated rapidly when a strong thunderstorm came and I was the only one who brought an umbrella. These thunderstorms are impressive - the thunder was ringing inside the pyramid, and kept rolling continuously for over 30 minutes. the site closes at 18:00, and since there is nothing else to see there I walked back to the hotel. I am writing this in a hammock in their garden by the pool. 5.8. I started early to catch the bus to Tulum. The ticket counter was closed the day before, and I could either take my chances with the first-class bus, which leaves before the counter reopens, or take a second-class bus that leaves earlier (first at 7:30) but takes an hour longer. I sat wedged into a seat that made airline cattle class seats seem pure luxury. The bus stopped at every village, and I had to watch out that nobody took my backpack from the luggage compartment at every stop. 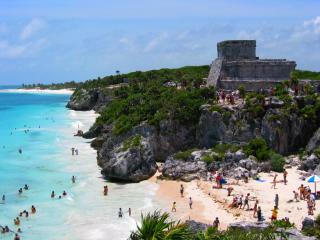 At Tulum I stored my backpack at the Weary Traveller hostel, for 10 pesos, and took a cab to the ruins. The Tulum ruins are not especially remarkable by themselves, but they are located exceedingly scenically at a white Caribbean beach with water so deep azure blue it hurts the eyes. Since it was blisteringly hot and sunny I returned to the Weary Traveller after a couple of hours and caught up on my email, before I took the bus, first class with inflight movie, to Chetumal. Incidentally, Tulum is quite out of the way, but first-class buses made it faster than Chichen Itza to Chetumal directly. In Chetumal I stayed at the Caribe Princess hotel, but it's not a good value for the money. I walked around downtown quite a bit and found it to be a pleasant change from the tourist watering holes I had been to the past two nights. No attractions, just a lot of restaurants and shops and lots of normal people hanging out and going about their business. 6.8. The bus from Chetumal to Belize City leaves at the Nuevo Mercado bus terminal, and takes four hours. Like most buses in Belize it's an old US school bus, which are built for shorter distances and shorter passengers. It was quite crowded at times. Belize City has a bit of third world atmosphere. Crowded ramshackle buildings, street vendors, but also some airconditioned shops. I tried to get flights from Guatemala back to Mexico, but there are very few of those and they were booked solid. Oh well. I then caught the boat to the Caye Caulker island, and was transported to a different world. 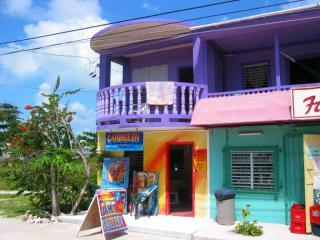 Caye Caulker is a tiny Caribbean island, just wide enough for four blocks of the small village. For the first time I had to check out several hotels before I found a room at the Island Hotel. I was lucky and got their overflow room, my own little house with no sea view but windows to three sides on the second floor. The island has everything one expects from a Caribbean island - azure water, white beaches, riots of colors, and relaxed and friendly people everywhere. Restaurants have names like "Rasta Pasta". I stayed two nights here. 7.8. The day before I had arranged a full-day snorkeling tour, visiting three spots on the barrier reef, and San Pedro on the neighboring island of Ambergris. There are lots of tour operators, all offering the exact same services, which meant that there were always clusters of boats at our destinations. I rode with Carlos Tours, on Front street just right of the main pier. Equipment rental is included. San Pedro on Ambergris island is basically a larger copy of Caulker. Snorkeling was great; perhaps not quite as varied and colorful than my exploits at Hawaii and Key West, but the boat wasn't traveling nearly as far. What made this tour exceptional were the experienced guides, who got in the water with us and pointed out fish with a white schoolteacher's stick. They even teased out various rare or hiding animals, like lobsters and eels. We also saw sharks, stingrays winging majestically over the ground, and lots of colorful fish. At the end, we were supposed to see a manatee, too. (Manatees look to me like huge seagoing sausages that have at some point crashed into a reef at full throttle.) Alas, the Manatee had other plans, and we didn't even get to leave a message at the tone. So we just explored the reef once more, and returned to Caulker. This trip was well worth the day spent here, don't miss it! 8.8. The first water taxi brought me to Belize City, where I got on a minibus to the bus terminal. Belize buses to Guatemala stop at the border. As before, border formalities were painless but expensive (B$ 37.50). Another minibus brought me to Flores (US$ 5). Flores is a pleasant clean village on an island in a large lake. A dam connects it to the shore. I selected the Santana hotel, a little upscale with rooms with private little terraces towards the lake. Shortly after checking in, a tropical storm took out all electrical power for an hour. 9.8. 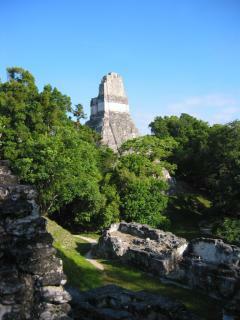 I had booked a 5:00 bus ride to Tikal, the main Mayan archaelogical site in Guatemala. The ride normally takes an hour, but a tire blew and had to be changed. The driver selected the better one of his two spares, which was almost as old and treadless as the one that just blew, but it got us to Tikal. Then the motor wouldn't start and we had to get out and push. Uphill. The weather in the morning was wonderful - sunny, cool (near 30 C instead of 40 C), and less humid. The site is huge, and unlikely the sun-scorched sites I had seen earlier it's all hidden away in a dense jungle that provides shadow. This early in the morning lots of animals were out and filling the jungle with the most exotic noise. I saw all kinds of birds, lizards, barking monkeys, and insects. The jungle didn't quite match my expectations formed by watching Tarzan movies as a child - trees are tall, but not as tall as expected, and the key feature is the enormous variety of plants that seem to fill all available space, especially near the ground. If you see only one Maya site on your trip, make it this one. The way back to Flores was uneventful, and I spent some time wandering around Flores (which doesn't take long), and ate a big steak plate at one of Flores' most expensive restaurants, the Hacienda del Rey, for US$ 12. I also met a Chinese gentleman and compared notes. Seems I won't miss much if I skip Antigua, north of Guatemala City. 10.8. I didn't want to get up at 4:00 again so I had booked the 7:30 bus to Chetumal. That was a mistake. It arrived 90 minutes late because it blew a tire too (same operator as yesterday, Lineas Dorades). Later, still in Guatemala, it developed engine trouble, and after several unsuccessful attempts at repairs the driver called a new one. Another five-hour wait by the roadside. Then the new bus came but it didn't have a license to cross the border, so we were told we'd have to change buses later. Fortunately a licensed bus came along later in the opposite direction, and we all got out and into the other bus. Turns out that the other passengers had bought tickets to Tikal but the bus would go to Flores instead, with no chance to connect. The bus stopped at a gas station later, and when the driver pulled out he forgot the open luggage compartment doors sticking out like wings. I didn't and jumped back, or he would have pinned me to some high steel scaffolding used for roof repairs. I kicked the bus to warn the driver, and he stopped centimeters before he would have brought down the whole thing on us. Although I only was in Belize for a few hours that day, they charged a B$30 exit fee. Entering Mexico was fast and carried no charge because I had kept my Mexican tourist card. In the end we arrived in Chetumal seven hours late, but the Mexican bus ticket counters were still open at 21:00 and we could make onward reservations. That's the sort of event that I always reserve a buffer day at the end of my vacations for... The drivers were always helpful and courteous (modulo the door incident), it's just that their hardware is no good. I stayed the night in the Ucum hotel, a cheap no-frills motel-like affair. When trying to adjust the showerhead, the pipe it was attached to fell off and I was looking at a crater in the wall gushing water. I stuck the pipe back in and took my shower. Oh well. 11.8. I spent the morning in Chetumal, and took a first-class ADO bus to Merida. (My fingers want to type DOA but this was the first bus on this trip that was really first class.) We made a lunch stop along the way, at a really nice buffet-style place with a little shrine containing two madonnas and fresh flowers in a huge mayonnaise jar used for a vase. For the first time, it was raining heavily all afternoon, and when we got to Merida around 20:00 many streets were flooded and no cabs were available. Fortunately the hotel I had reserved, the Hotel Las Monjas, was close by and I managed to walk there without being washed away by the surf on the sidewalks caused by passing cars. The hotel is very plain but quiet. 12.8. Originally I had planned to visit Campeche today, but I didn't feel like spending another six hours on buses so I went to Dzibilchaltun instead. That's only half an hour by bus. Ancient VW minibuses, to be precise, with views on the road through the rusted floor. 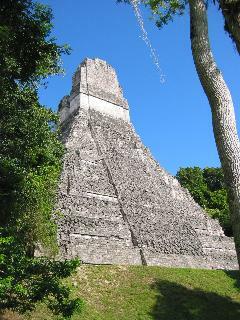 Dzibilchaltun offers a few interesting ruins, like an unusually low and large temple, and the widest known Mayan stairs. They also have a well-designed small museum there with English explanations. I had to wait for an hour at the roadside for a returning bus. Back in Merida, I had pesos to burn, and went to the fancy Portico del Peregrino restaurant for an excellent Lime chicken soup and chicken in banana leaves with Mayan spices. They are exceedingly efficient there, when I put my fork down, the plates vanished instantly and they started quizzing me about dessert options while I was chewing. 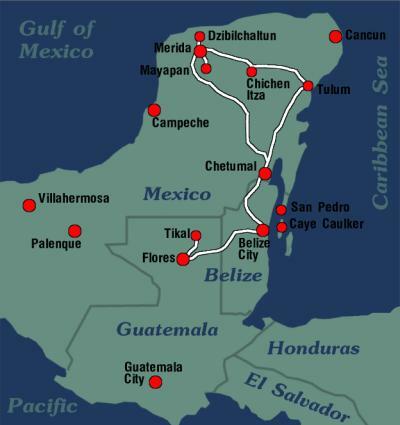 I was using the Lonely Planet guide for Belize, Guatemala, and Yucatan. I could not have done this tour without this book. Nearly everyone there carries it. I spend some 30 hours in buses, ranging from decrepit school buses to luxury liners. It's not as bad as it sounds because there are so many people to talk to and so much to see. Food was a bit of a problem - I was warned that it would be mostly very plain and not at all like extra delicious TexMex, which is mostly unknown here. Mangos and pineapples are great, oranges and most other fruit aren't. Tap water is not drinkable so I bought large purified water bottles wherever I went. Sodas are widely available. Tap water is supposed to be ok for brushing your teeth but I didn't risk it. I also avoided lemonades, salads, and other dishes that got into contact with unboiled water. I was spared the common "turista" kind of diarrhea, a.k.a. Montezuma's revenge. Although I was there in the rainy season, August, it didn't rain all day. Mornings were a little cooler and sunny, we'd get an afternoon shower or thunderstorm every other day on average, and mostly overcast all afternoon. Temperatures got into the low 40s C, with breezes only near the sea. The biggest problem was the very high humidity. And mosquitos, bring a repellent containing 20-30% DEET as an active ingredient. For clothing, shorts and lots of thin and light-colored short-sleeved shirts are sufficient. I brought long pants and long-sleeved sweatshirts but never used them. My umbrella came in very handy a few times. I also bought a hat, the sun can be fierce and sun screen won't last all day. It was never a problem finding a hotel. 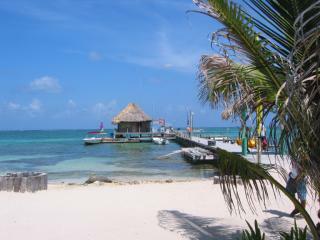 Except on Caye Caulker, my first choice always had rooms. Hotels tend to be very plain, even primitive. (I later learned that outside of the towns one can find very luxurious haciendas, but I wouldn't have wanted to have spent time on hotel-hunting anyway.) The American tradition of sealing hotel soap in impenetrable wrappers is followed punctiliously. Ceiling fans have wall controls where 1 is fastest and 6 is slowest. Mexican pesos are no problem, ATMs are available and accept international cards, including my EC ATM card. This is not the case in Belize and Guatemala! Everyone in Belize seems to accept US dollars, cash, at a fixed rate of 1 US$ = 2 B$. US$ traveller cheques are usually fine too. Bring plenty of US$ cash and don't forget the B$30 exit fee. Guatemala is similar but the Quetzal exchange rate is floating and people expect payment in Quetzales, and don't have much change. Some hotels and banks accept US$ traveller cheques, but one bank I tried did not accept my EC/MC cheques and insisted on Amex. Fortunately my hotel didn't mind. Expenses are fairly low if you stay in low and mid-range hotels; 30-40 Euro per day should be fine. Phone calls in Mexico are best made with a Telmex card at pay phones. The cards are sold at kiosks. My GSM phone only worked in the larger Mexican cities but not on the road or in Belize and Guatemala. The latter might have been caused by my provider lacking a roaming contract. If you liked this report and would like to read my exotic travel guide, click here.